Over the past eight weeks, I have been on an individualized fitness training program created and directed by Brian Theiss in Westlake Village. 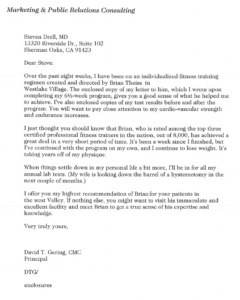 The enclosed copy of my letter to him, which I wrote upon completing my 6 1/2-week program, gives you a good sense of what he helped me to achieve. I’ve also enclosed copies of my test results before and after the program. You will want to pay close attention to my cardio-vascular strength and endurance increases. 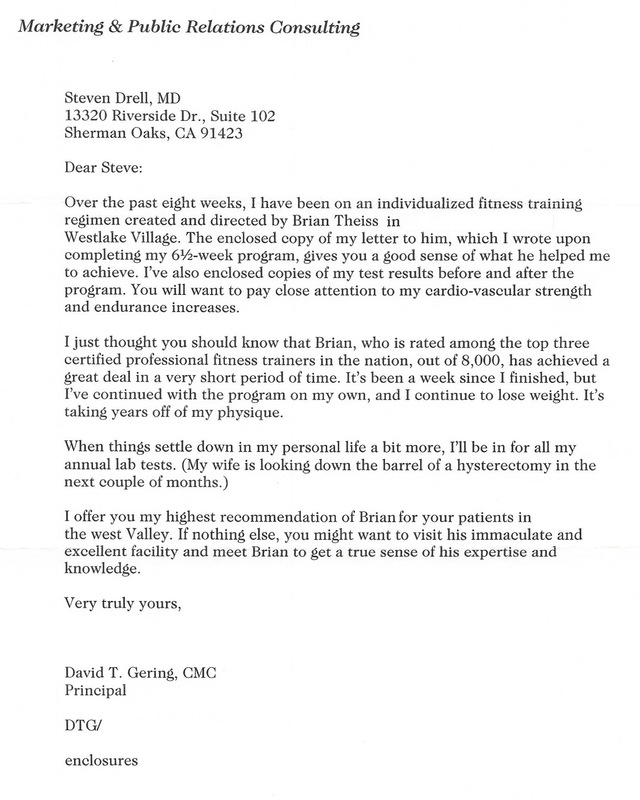 I just thought you should know that Brian, who is rated among the top three certified professional fitness trainers in the nation, out of 8,000, has achieved a great deal in a very short period of time. It’s been a week since I finished, but I’ve continued with the program on my own, and I continue to lose weight. It’s taking years off of my physique. I offer you my highest recommendation of Brian for your patients in the west Valley. If nothing else, you might want to visit his immaculate and excellent facility and meet Brian to get a true sense of his expertise and knowledge.